The two most important recommendations in the recently released Alvarez and Marsal “efficiency review” of Kansas government went unheeded in the governor’s budget. The efficiency report tells lawmakers that in order to be financially healthy, Kansas must have a structurally balanced budget—one in which recurring revenue at least equals expenses. And the state needs a rainy-day fund or reserves. The governor’s budget proposes neither. FY 2017 will be the fourth fiscal year in a row with general fund income well below expenses. Each year lawmakers have scrambled to fill the resulting gap, first by blowing through $709 million in reserves, and then by withdrawing record amounts from the highway fund and other funds. The governor’s revised budget for FY 2017 proposes more of the same. 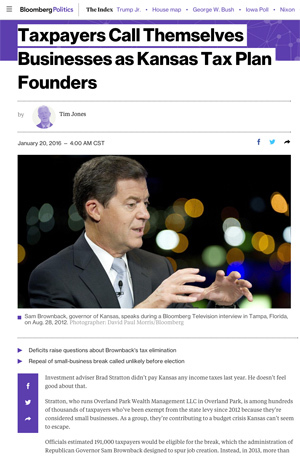 Brownback’s 2012 income tax cuts, which disproportionately benefitted the wealthiest Kansans, first damaged state finances in FY 2014. In a normal time, income tax revenue would rise, but in FY 2014 it fell $700 million, and then stayed down at a dramatically diminished level. Today, annual income tax collections would be $1 billion higher, if not for the 2012 tax cuts. Instead, recurring general fund revenue only reaches an estimated $6.1 billion in FY 2017, even after lawmakers raised sales and cigarette tax rates last year. The governor’s proposed $6.4 billion in expenditures exceeds expected FY 2017 income by $300 million, even though the governor applied spending cuts to state programs in July, again in November, and now again in January. And remember, the $6.4 billion spending level has schools stuck in block grants, disregards state employees, leaves troubles at state hospitals unaddressed, and does not provide enough Highway Patrol troopers. In addition, the state has taken on unprecedented debt in an attempt to cut spending in the short term. On paper, the governor’s budget shows FY 2017 ending with a small bank balance. His budget is built using the November revenue estimate, but already in December revenue collections missed the mark, basically wiping out the paper balance. Any further revenue deterioration will require even more budget cuts or transfers in what remains of FY 2016 and in the proposed budget for FY 2017. State law requires the general fund ending balance to be 7.5 percent of expenditures. For a budget that spends $6.4 billion, that calculates to $480 million. 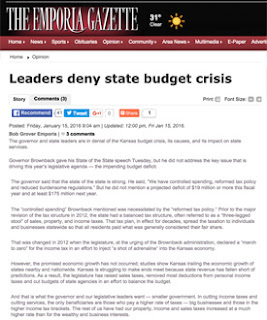 Until lawmakers acknowledge that the 2012 income tax cuts went much too far, and fix the problem, Kansas will stagger from budget crisis to budget crisis. Schools and state agencies will continually face an uncertain future, in which funding can be pulled out from under them at any moment. And the state’s political energy will be focused on crisis resolution rather than investing in education and other essential services that matter for the future. To be financially healthy again, Kansas must raise its income stream to cover expenses, as well as build back reserves. The simplest, most direct solution would repeal the gaping tax loophole that exempts most businesses, including some very, very large limited liability corporations, from paying any income tax at all. 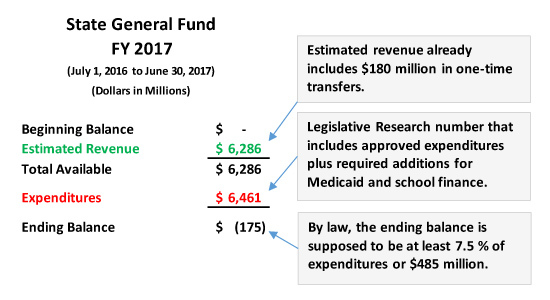 Adopting the governor’s structurally unbalanced FY 2017 budget only guarantees that Kansas will continue to struggle, and face financial troubles again next year.